Check carefully when buying a similar looking RC telescope at a cheaper price. Always check the following accessories are included, because if they aren't, you will need to buy them separately at higher cost. 2x Vixen dovetail bars plates top and bottom (without which the front and rear mirror cells are not consistently supported causing uneven tilt issues, as we have discovered). 3x Focuser extension tubes (2x 25mm and 1x 50mm). These go between focuser and optical tube as required to achieve backfocus. Without these, you will struggle to achieve focus for most CCD or DSLR imaging systems, and your telescope probably won't work without them. A 2" Dual Speed Crayford Focuser included as standard. It will handle a DSLR or CCD camera, and a light weight filter wheel perfectly well, and is adequate in most imaging situations. It is adequate for a DSLR/CCD camera and light weight filter wheel, however you may consider the Starlight Feathertouch as an upgrade for more precise control. Low weight of about 5.5kg makes this the ideal portable long focal length imaging scope, freeing up your mount capacity for other accessories. High quality BK7 Mirrors with 96% reflective enhanced aluminium coatings and a Quartz overcoat (Silicon dioxide). 6" F9 true hyperboloid primary & secondary Mirrors (1370mm Focal Length). Multiple internal light baffles line the interior of the optical tube. Fast efficient cool down time usually twice as fast as a normal SCT or Maksutov, due to the open-tube design of the RC. This telescope is designed with enough backfocus to use an off axis guider, AO unit and filter wheel. Therefore, to create the most rigid imaging train possible, instead of placing extension tubes after the focuser it's best to place them between the focuser and the rear mirror cell. Therefore 1x 50mm and 2x 25mm large diameter extension rings are included for this purpose, which can be placed between the focuser and telescope (with zero flex), for adjusting your backfocus. This true Ritchey Chretien astrograph is completely optimised for imaging. 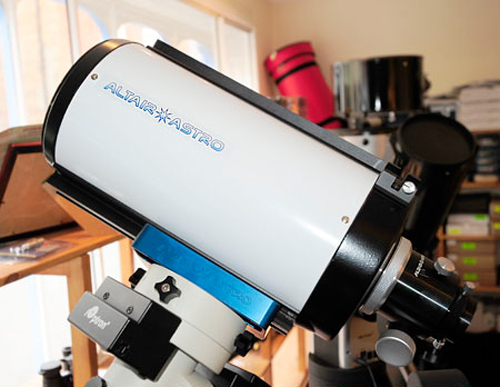 Consider these points when choosing a dedicated imaging telescope. Aperture, price and weight. A pure two-mirror optical system means zero colour aberration and a large aperture with high resolution compared to refractors costing many times more and weighing many times more, to gain the same resolution, whilst using a reasonably priced mount. No mirror shift. Because it has a fixed focuser, the primary mirror flop and resultant image shift issues associated with long focal length SCT telescopes with moving mirrors are avoided. There is no need for mirror locks and the additional problems these bring when it comes to focusing. There aren't any complex internal parts to move the mirrors back and forth while attempting to keep them accurately aligned so there's less to move about. Repeatable focusing. 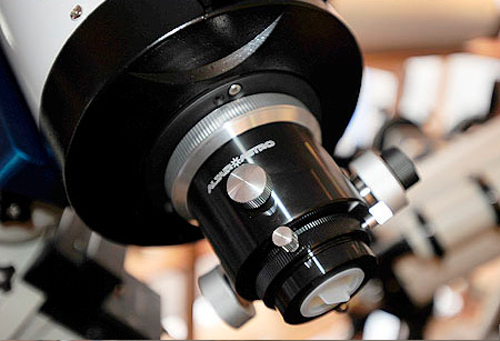 Another benefit of a high quality external focuser, is that the mirrors don't have to move relative to each other to focus the telescope, and so because everything remains in place, the focal point doesn't change outside the tube, making it easier for you to achieve repeatable, accurate focusing time and time again. That's essential for imaging. A better focuser for a great price. Unlike a standard Crayford focuser, the LBF focuser won't flex as much and it can take a higher load such as a DSLR or filter wheel, without slippage or backlash. That's because it has a longer and more precise steel load bearing surface, which is in contact with the focuser tube along more of it's length, rather than being supported by bearings with small contact points - a common issue with other Crayfords. This steel track focuser surface will not wear unevenly like aluminium-only surfaces on other focusers. Easier to mount and guide. The optical tube is very light yet very rigid and strong, minimising flex. It can be carried by a reasonably priced EQ mount, along with a guide scope and wide field refractor. Fastest cool-down time in it's class. Don't spend the whole night waiting for your scope to cool down. Closed tube telescopes with corrector plates such as Maksutovs and SCTs can take so long to cool down that they never reach ambient temperature during the whole night. The RC optical tube is an open design, minimising cool down time compared to SCTs with closed tubes. Contrast and controlling stray light. The internal knife edge baffles and matte black interior ensure high contrast and minimize the intrusion of stray light, reducing background glare on long exposure images. You will never have to to line the interior of this instrument with "flocking paper" to improve contrast - common practise with other imaging reflectors. Because there is no large corrector plate pointing at the sky, it's very rare for condensation or dew to form on the optics and it almost never occurs. Optical performance: The surfaces of the Ritchey-Chrétien primary and secondary mirrors are hyperbolic, and are carefully optimised to reduce coma, an optical aberration which results in flared stars at the edges of the photographic field in other Cassegrain designs. 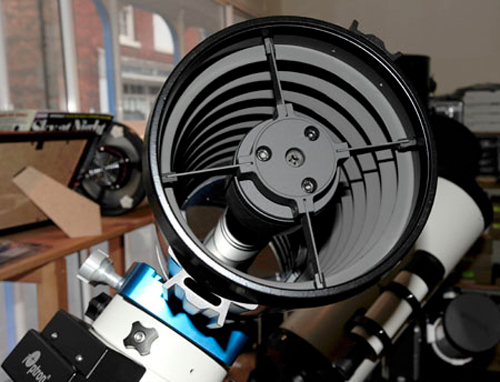 The Ritchey-Chrétien design was previously only available in large scale observatory optics, however, as mirror polishing techniques have advanced, they are finally available to the amateur astro photographer at a reasonable price. Price and performance for this aperture at an F9 focal length. For the aperture, resolution, and performance, this scope is simply the best value we have been able to source. We do not know of any other imaging OTA which can deliver results at this focal length.